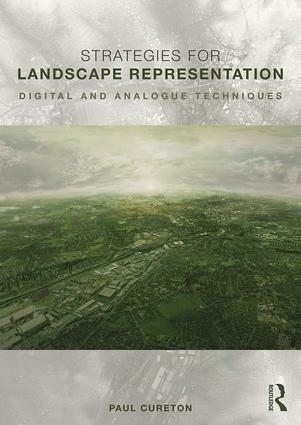 Strategies for Landscape Representation discusses a variety of digital and analogue production techniques for the representation of landscape at multiple scales. Careful consideration is required to represent time, and to ensure accuracy of representation and evaluation in the landscape. Written as a guide for making appropriate selection of a wide variety of visualisation tools for students and built environment professionals with an interest in landscape, the book charts emerging technologies and historical contexts whilst also being relevant to landscape legislation such as Building Information Modelling (BIM) and Landscape Assessment. This book is an innovation-driven text that encourages readers to make connections between software, technology and analogue modes. The management, choice and combination of such modes can arguably narrow the unknown of landscape character, address the issues of representing time and change in landscape and engage and represent communities’ perceptions and experience of landscape. Showcasing international examples from landscape architecture, planning, urban design and architecture, artists, visualisers, geographers, scientists and model makers, the vitality of making and intrinsic value of representational work in these processes and sites is evidenced. An accompanying companion website provides access to original source files and tutorials totalling over a hundred hours in mapping and GIS, diagrams and notation, photomontage, 3D modelling and 3D printing. This book negotiates a careful balance between genuine scholarly inquiry and practical usability for the reader. Drawing on sources across the built environment disciplines as well as social, philosophical and critical theories, the book is comprehensive in its scope. The rigour of the research allows the author to demonstrate the importance of representational strategies to the discipline of landscape architecture, drawing on a wealth of beautifully illustrated historical and contemporary examples. What is crucial is that such academic research is presented in an accessible and usable manner: the clear intention is for the reader to mobilise the knowledge presented within the book, making it extremely valuable to practitioners, students and academics alike. Investigations into how urban and territorial landscapes are represented are essential endeavours for landscape architecture and urban design disciplines. Paul Cureton’s approach of working between practical methods of drawing and mapping and philosophical conceptions of representation make this a unique book and a significant development of landscape discourses. Paul Cureton brings an expansive and important account of various techniques for the representation of landscape. Informative and insightful, the book brings sharp focus on key concepts including: agency, valence and the temporal aspects of landscape, whilst opening up the intellectual debate for future landscapes in order to provide a strong case for designers to make a considered approach from the increasingly wide range of representation and evaluation tools and methods available. Nick Dunn FRSA, Chair of Urban Design, Research Director: Lancaster Institute for the Contemporary Arts and Associate Director: Institute for Social Futures, Imagination Lancaster, Lancaster University. Contributing to the important task of filling in the conceptual void that lies at the heart of design education, Dr Cureton expands our knowledge of the scope and role of representation in landscape architecture. This fresh approach, capturing the energy and depth of graphic possibilities, explores the purpose and intent of a wealth of representational methods and techniques. Setting out a new and expanded field of design practice, connecting ideas and form, art and design, this book will contribute significantly to the resurgence of interest there is in landscape architecture around the world, helping students and practitioners alike to acquire new skills at the analogue/digital interface and to realize the full communicative potential of visual, graphic expression in design. Paul Cureton is a Senior Lecturer in Architecture and Unit Leader for Future Cities at the University of Hertfordshire, UK, Member of the Herts UAV Group, Researcher for the International Garden Cities Institute and Researcher for HS2LV at Birmingham City University, UK. He holds a PhD in Landscape Architecture Representation from the Manchester School of Architecture, UK. Primary research interests include GIS, UAVs, mapping, modelling and digital fabrication.